CaGBC Greater Toronto Chapter - Click Here to be transferred to the external registration page. We ask that you pre-register for the event meeting at your earliest convenience online at Canada Green Building Council Greater Toronto Website, Discount code is provided to ASHRAE Toronto Chapter member upon request. Please contact ASHRAE Chapter Office (Sabrina Tai - 905. 602. 4714 or stai@hrai.ca) No walk-in registrations will be permitted for this event. Based on Standard 189.1-2011, Standard for the Design of High-Performance Green Buildings, this course provides the minimum requirements for the design, construction and plans for operation of high-performance green buildings, including new buildings and their systems, new portions of buildings and their systems, and new systems and equipment in existing buildings. The seminar presents the goals of establishing mandatory criteria in all topical areas, providing simple compliance options and the complement of green building rating programs for Standard 189.1. Differentiate how Standard 189.1 varies from green building rating systems (e.g., LEED, Green Globes). 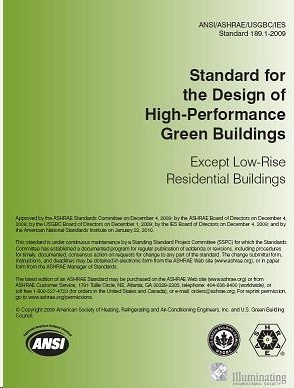 Relate Standard 189.1 to other building design standards and guidelines. Recognize the importance of developing a code-intended standard for design of high performance green buildings. Identify mandatory provisions in the Standard and better comprehend their intent. Identify and understand the two compliance path options (Prescriptive and Performance) and their associated provisions in Standard 189.1. Understand the key energy-related design requirements in Standard 189.1. Clearly grasp the intent and criteria contained in the "Plans for Operation" portion of the Standard. Dr. Lawrence is a Senior Public Service Associate with the University of Georgia, and has 30 years of professional experience in engineering and environmentally related fields. Before going back for his Ph.D. in Mechanical Engineering at Purdue, he spent approximately 20 of those years in industry and consulting. He is the past chair of ASHRAE Technical Committee 2.8, “Building Environmental Impact and Sustainability”, and is a member of the committee which wrote the ASHRAE standard on high-performance green buildings (Standard 189.1). As an ASHRAE Distinguished Lecturer, he gives presentations and workshops on green building design at venues around the world. At the University of Georgia, Dr. Lawrence teaches courses in HVAC, Green Building Design, Residential Building Design, and Heat Transfer.